Mercedes quarterback Mark Ledesma (3) drives into the Edcouch-Elsa defensive line as he carries the ball in a 32-5A district game at Benny Layton Sr. Memorial Stadium October 20, 2017, in Edcouch-Elsa. 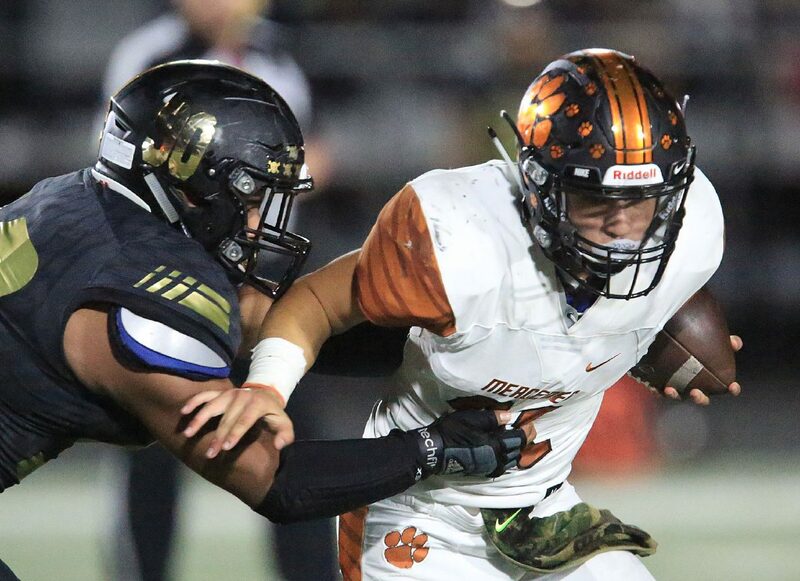 ELSA — Senior linebacker Roger Adame III was a calming presence for a Mercedes defense that dominated. 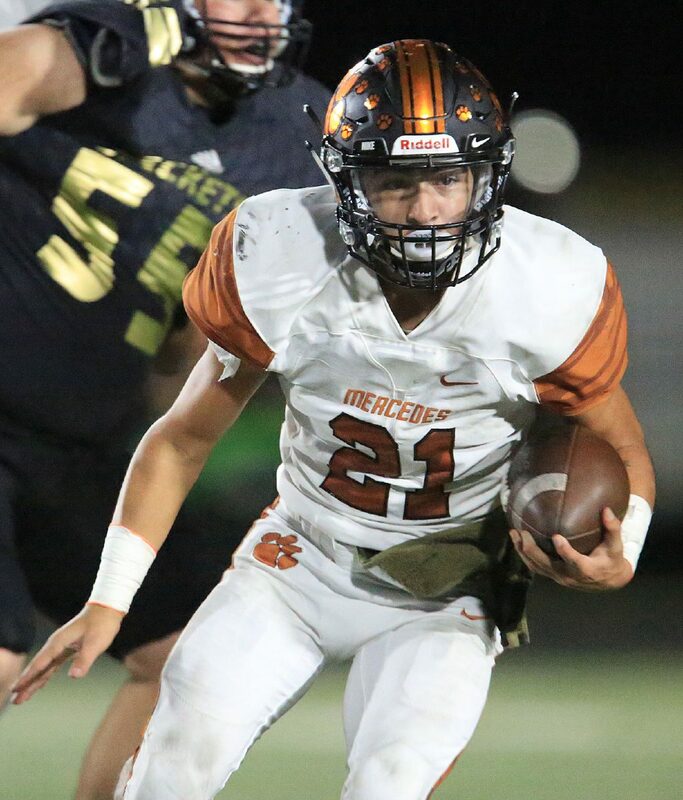 Mercedes used that effort to pick up a 34-14 win over Edcouch-Elsa on Friday night at Benny Layton Sr. Memorial Stadium in the 65th meeting between the two teams. With the win, the Tigers improve to 5-2 overall and 3-1 in District 32-5A. Edcouch-Elsa drops to 4-3, 2-2. Mercedes running back Sonny Vela (21) carries the ball against Edcouch-Elsa in a 32-5A district game at Benny Layton Sr. Memorial Stadium October 20, 2017, in Edcouch-Elsa. 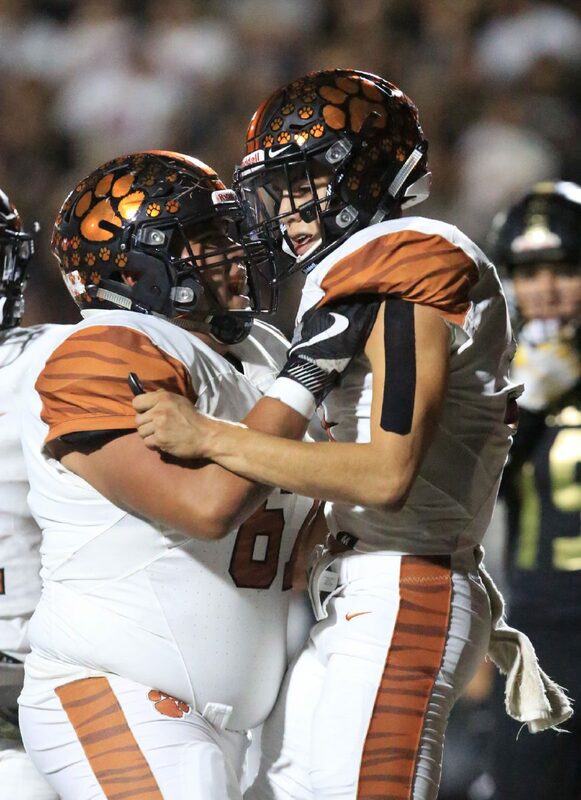 Mercedes' Dustin Valdez (67), left, celebrates with quarterback Mark Ledesma (3) after Ledesma carried the ball to the endzone for the touchdown against Edcouch-Elsa in a 32-5A district game at Benny Layton Sr. Memorial Stadium October 20, 2017, in Edcouch-Elsa. Mercedes running back Sonny Vela (21) carries the ball against Edcouch-Elsa defensive lineman Cody Alvarado (90) in a 32-5A district game at Benny Layton Sr. Memorial Stadium October 20, 2017, in Edcouch-Elsa. Mercedes quarterback Mark Ledesma (3) tries to break the takle of Edcouch-Elsa defensive back Jay Cardenas (32) as he carries the ball for a gain of yardage in a 32-5A district game at Benny Layton Sr. Memorial Stadium October 20, 2017, in Edcouch-Elsa. The win evens up the all-time record between the two schools at 32-32-1. Since Roger Adame Jr. took over at Mercedes in 2014, he has never lost the matchup. Ledesma put on a show on offense. He finished with 150 passing yards and 117 rushing yards. He threw for one touchdown and ran for three more. While Ledesma was getting Mercedes’ offense points, Roger Adame III was getting Mercedes stops on defense. Adame III was sidelined during Week 1 with an arm injury. He returned to the lineup in limited duty last week, playing only a few snaps, but this was the game he wanted to be in. 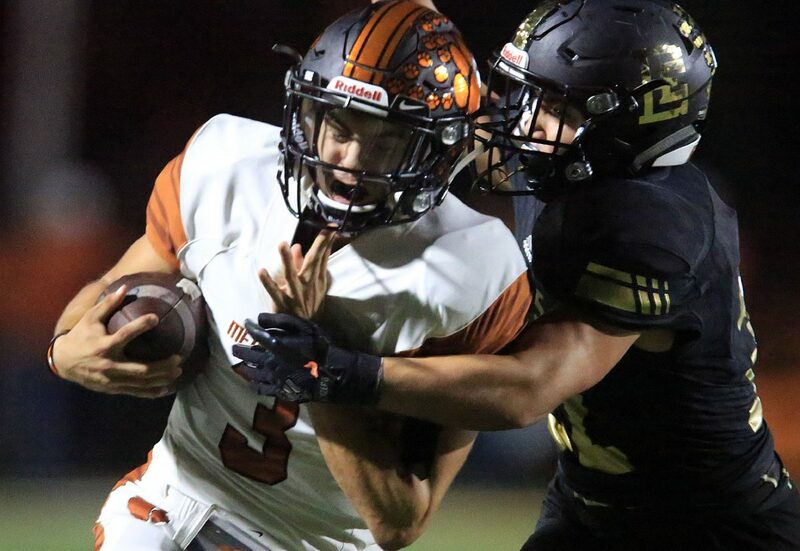 Edcouch-Elsa’s backfield duo of senior running back Jorge Gomez and junior quarterback Albert Treviño had a big night, but the Yellow Jackets’ lack of a passing game really hurt them. E-E attempted just three passes and only completed one. Still, Gomez rushed for 162 yards, and Treviño had 135. The teams traded 1-yard runs to start the scoring. Ledesma scored for Mercedes, then Gomez for Edcouch-Elsa. Following Gomez’s touchdown, Mercedes kept rolling. The Tigers went 87 yards on five plays, capped off with a 26-yard pass from Ledesma to junior wide receiver Leeroy Garcia. Garcia’s score put the Tigers ahead 14-7, and they took that lead into halftime. Mercedes took the ball 65 yards in five plays to open the second half, finishing with a 19-yard touchdown run from junior running back Aleks Ramos. The Tigers never looked back after that, tacking on two more rushing touchdowns from Ledesma. 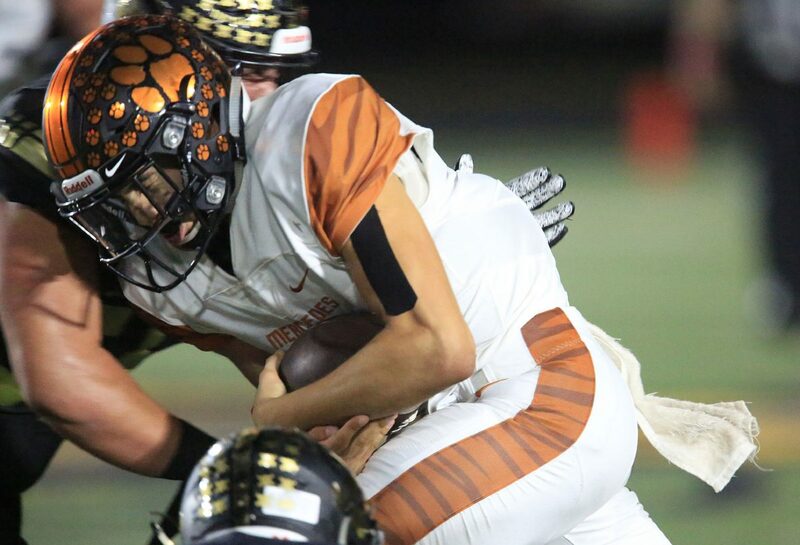 Though Marc Ledesma and his twin brother, senior wide receiver Matt, didn’t have a touchdown on the evening, they still linked up on a few big plays for the Tigers. The Tigers backed themselves up to their own 5-yard line midway through the first quarter before Matt found Marc for a 42-yard bomb on first-and-29. The pass flipped the field position and made way for the rest of the drive that would result in Mercedes’ first score. For Mercedes, Ramos finished the game with six carries for 78 yards and the score. Senior Matt Gracia had six rushes for 61 yards, and sophomore Sunny Vela had nine carries for 59 yards. Roger Adame III provided senior leadership in the heat of the moment. Penalties became a common theme as tempers flared throughout the rivalry game. Roger Adame III was always there in the midst of the chaos to pull his teammates out of the fray. Before the game, The Monitor writer Saul Berrios-Thomas caught up with Edcouch-Elsa coach Joe Marichalar and Mercedes coach Roger Adame on The Monitor’s Facebook Live.